Buy a Condo at Riverside Condo in Chiang Mai. = 100 % Full Legal Ownership. Despite a foreigner cannot own land in Thailand, he can however own a condo. Yes for sure, you can acquire a condo easily and fully legal in your own name(s). The ownership is entirely protected by a Title Deed (or search Google for the Thai Condominium Act 2008). 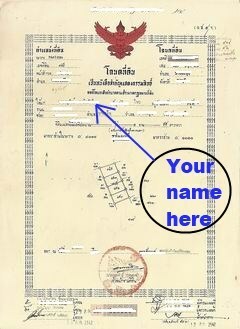 Thai 'Chanote' or Title Deed. When you buy a Condo at Riverside Condo, your Ownership gives you complete security and protection, just as in most Western Countries. As a Thai Real Estate Agent, we can provide you with the Official Title Deed and register your Chiang Mai Condo at the Land Office in one day (if all related documents are provided to us in time of course). You can hold your Chiang Mai Condo as a private residence property or rent out your right. A Thai Condo is an inheritable asset. If you would like to sell or rent your condominium, apartment, flat or house, please do not hesitate to contact Joy at Chiang Mai Riverside Condo as we can assist you with this. We offer very professional service in many languages at a normal fee. Buying a condo in Thailand right now, could be proven a wise investment. very good yet affordable medical infrastructure and services. More demand for prime real estate.